Since its inception in 1995, Worms has appeared on numerous gaming formats from the Amiga right up to the Nintendo Switch. In between, the worms have waged war on some pretty unlikely systems, including the original monochrome Game Boy and ill-fated mobile phone hybrid, the N-Gage. There were even short-lived versions for Facebook and Sky Digital, now sadly lost to time. 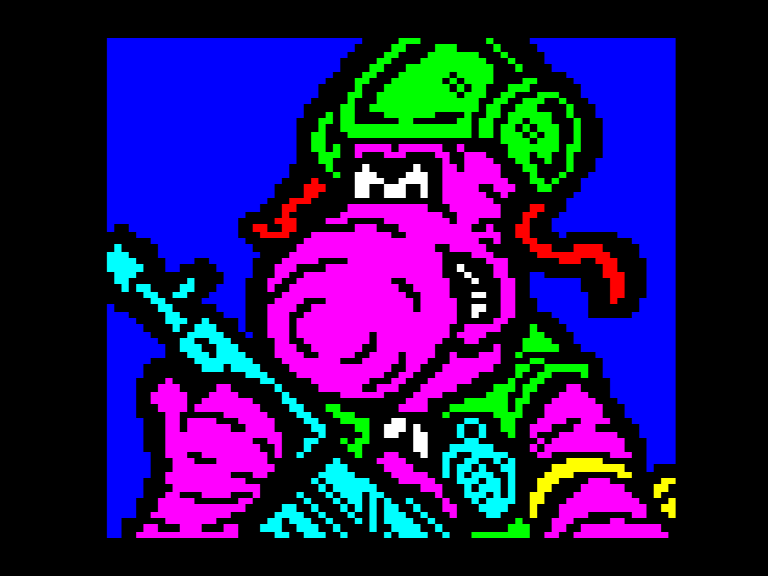 But of all the versions ever created, few are weirder or more unlikely than the sadly cancelled Worms For Teletext. Long thought to be completely lost, Worms For Teletext was developed around 23 years ago and was designed to run on the UK’s Teletext system, which allowed users to access and browse basic pages of text and rudimentary graphics, broadcast within their TV signal. Super ambitious and way ahead of its time, Worms For Teletext was prototyped in 1996 and was test-broadcasted for six weeks in March and April of that year before ultimately being shelved due to ludicrous technical demands that made the game unfeasible. So how was Worms For Teletext re-discovered all these years later? Believe it or not, it is actually possible to recover Teletext content from the past, simply by using old VHS tape recordings of TV shows to access the data transmitted within the analogue TV signal. See the excellent Teletext Archaeologist website for more evidence of this technical wizardry if you don’t believe us! It’s through this remarkable quirk of retro technology that Worms For Teletext was recently recovered, when amateur VHS detective Conny Whopper stumbled upon an unlisted page, never intended for the public to see, while perusing the content hidden in a recording of Channel 4’s almost as short-lived sitcom, Porkpie. Worms For Teletext was indeed real! Developed by Team17’s Multimedia Division, known as “The Big Room”, in partnership with Teletext itself, the magical game was made possible thanks to a frankly painstaking amount of illustration work from the design team. Since TVs contained no real computing power and were not capable of two-way communication with a server, the artists had to anticipate every single move a player might make, and its outcome, and make sure a full screen (or page) was already drawn to represent every possible scene and broadcast to a hidden page, ready to be displayed at the right moment. 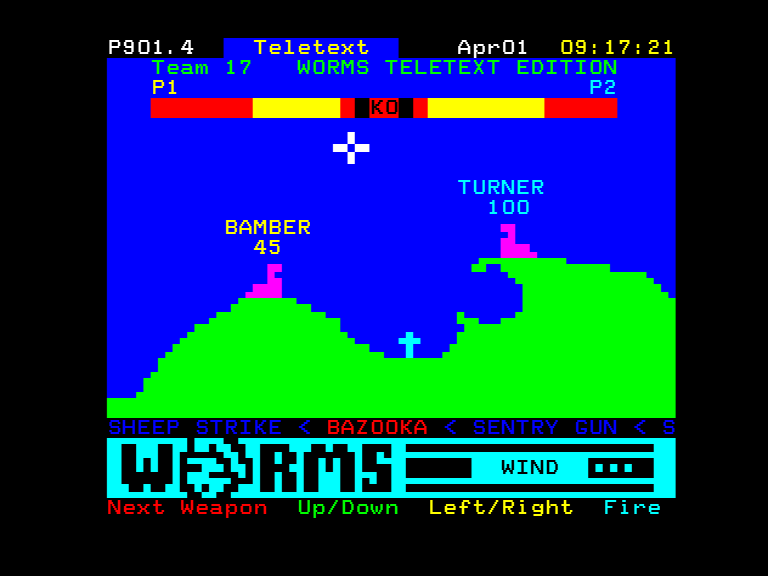 Though an ingenious solution, the tech behind Worms For Teletext was sadly limited by the small number of pages that could be broadcast in any one day, meaning that the variables of gameplay possibility had to be tightly controlled. To get around this limitation, the designers decided that only a tiny number of weapons and landscapes would be usable on any one day, with different “schemes” put into daily rotation. Monday would feature mines, for example. Fun Fridays were “rockets only”. While Sunday was of course reserved for the Holy Hand Grenade. Such compromises were essential to get a game like Worms working on Teletext, but what really made this experimental game a failure was the draw time. Each scene took approximately 10 seconds to draw onto the TV screen, and since a re-draw was forced every time a Worm moved a pixel or changed its aim, well, it soon became pretty unbearable. After around six months of development, and a few weeks of testing, the “Big Room” team decided it was probably best to shelve Worms For Teletext and began work on something completely different: a CD-ROM called Access All Areas, which contained a guide informing new computer owners how to connect to the internet and which websites they should visit once “on-line”. Sadly, all source code and art assets for Worms For Teletext were tragically lost in the summer of 1998 when a junior programmer accidentally spilled a large jug of Dandelion & Burdock over an Amiga 4000, frazzling the hard drive within. We all promptly forgot about the game and hadn’t paid it another thought until it was re-discovered this week. It sure has brought back some memories for those of us who worked at Team17 towers back then, and we hope you’ve enjoyed reading about this obscure slice of Worms history too. Keep up with all things Worms: Follow on Twitter, Like on Facebook, Join the Discord or sign up for the Team17 Newsletter.